Every episode of Better Call Saul has changed the show’s title sequence each week with a choice image unique to each week. 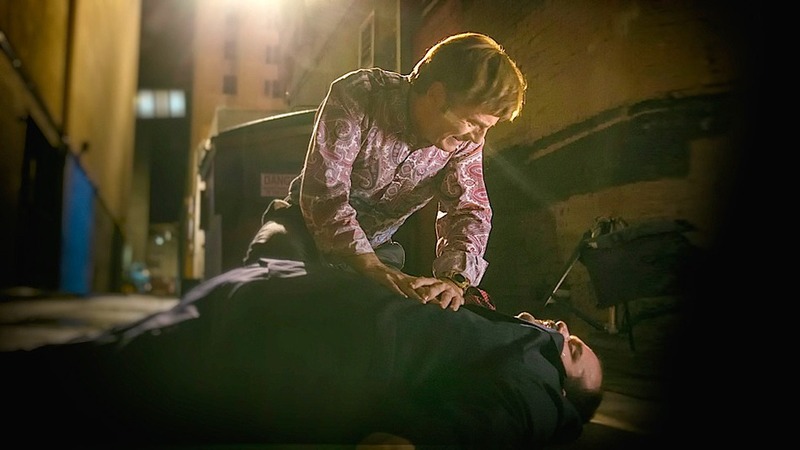 The intro for the first season finale, “Marco,” is perhaps the most openly symbolic of the events to follow: a coffee cup that says “World’s Greatest Lawyer” falls off the table and shatters into a million pieces once it hits the floor in slow motion. After Chuck’s devastating admission and put-down to Jimmy in the penultimate episode, the coffee cup is a portent of things to come for the younger McGill brother as his hopes and dreams come crashing down, with his brother’s lashing representative of the final push over the edge. When Jimmy returns to HHM to finally hand over the Sandpiper case, director Peter Gould (who also wrote the finale) frames Jimmy within the stark yellow staircase to emphasize his tiny form within the expansive lobby. Despite his greater ambitions, Jimmy remains at the small-time level and perhaps that’s because it’s just part of his nature. Like a drug addict going through relapse, Jimmy can’t help but scratch the itch of his elusive Slippin’ Jimmy persona. He returns to Chicago to meet up with old friend Marco, whom he hasn’t seen since leaving for New Mexico to work at HHM with his older brother. Chuck (and most of the other regulars) hardly appears and yet his influence on Jim’s actions (past, present, and future) hangs over the finale like a specter. There’s a mixture of disappointment, and probably even regret, that rings through Jimmy’s interactions with Marco about his second life in New Mexico. Jimmy kept up his end of the bargain for Chuck getting him out of prison by working hard, even for pennies, and making a real effort to rise above himself and become a new man. But Chuck still looked at his brother with apprehension about these goals because he couldn’t get past the lingering thought that Jimmy would eventually revert back to his criminal side once he attained more power. Would Jimmy have gone down this route? That looks doubtful given his unwavering inclination to do the right thing even if it screwed him over, but there’s no doubt that the crook inside was ready to burst out if the safeguards collapsed. Marco and Jimmy’s week-long bender of scams is presented in a montage of hazy imagery and jazzy music to heighten the allure and thrill of the moment that Jimmy is going through. He hasn’t done this in such a long time that reverting to his old ways is positively euphoric, especially after the emotional breakdown he experienced earlier at the senior center bingo game. Speaking of which, these two sequences contain sly references for the mindful Breaking Bad fans out there who remember “Belize” and Saul’s Kevin Costner story. It’s a testament to the quality writing that these callbacks feel natural and subtle as opposed to the usual approach prequels take by double-underlining the references as painfully awkward fan service. The mark of a successful prequel is one that follows the general track implied by the previous work while also subverting expectations and sketching in plot and character work that stands on its own. Early on, Howard felt less like a character and more as a stand-in just to be a jerk to Jimmy for little reason. Last week’s revelations completely shifted the relationships of multiple characters and “Marco” follows through on it when Jimmy goes to personally tell Howard that he’ll give over the Sandpiper case. The two men aren’t exactly buddy buddy yet, although glimmers of humanity and understanding show through in their conversation. Given Jimmy’s decision on the Santa Fe law firm job that Kim refers him to, I wouldn’t be surprised if Kim and Howard experience a role reversal in their sympathies for the lead. Jimmy’s ultimate choice to turn away from the new firm that’s willing to work on the Sandpiper case is an especially important move forward (or backward, depending on how one perceives this direction) for Jimmy on his way to becoming more like Saul Goodman. “Marco” is atypical for a season finale; there’s no explosive encounters or scenes of heightened drama and yet it’s the seemingly small gestures that show major change. The Santa Fe refusal shows that Slippin’ Jimmy isn’t intrinsically tied to bad element Marco, since the familiar crook had keeled over in a heart attack, and that Jimmy really does have it in him to turn onto the easy road. 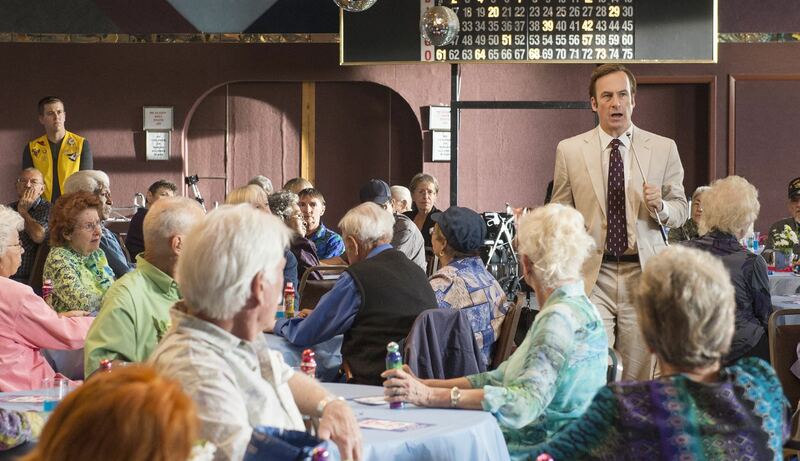 As the double yellow road lane lines define in the final shot, set to Deep Purple’s “Smoke on the Water,” there’s a hard boundary between the two sides of Jimmy McGill’s life and now there’s no going back.